The Assignment: Make a short piece of music based on a typographic symbol for the word "silence." This assignment was made in the evening, California time, on Thursday, October 16, with 11:59pm on the following Monday, October 20, 2014, as the deadline. 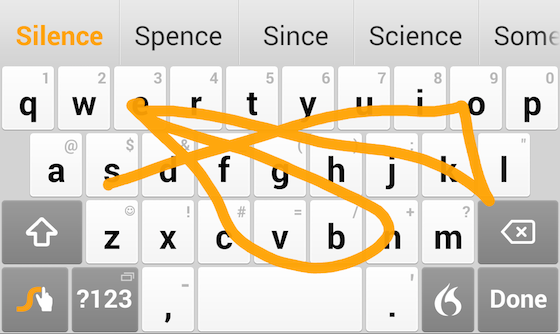 As is evident in the image, this is the “Swype” gesture for the word “silence.” Swype is an alternate text-entry system in which a single stroke along the various keys that spell a word trigger the word’s appearance, in contrast with the traditional keyboarding method of typing with one keystroke after another. The resulting symbols for words can take on a certain familiarity and even a kind of enchantment as time passes and frequency of use increases. The symbol that results from the word “silence” has many characteristics, including bit not restricted to the sideways hourglass timer, the inherent asymmetry, and the mix of sharp angles and curves. Step 2: Develop sonic associations with this symbol. Step 3: Produce a short piece of music informed by those associations. Step 4: Upload the finished track to the Disquiet Junto group on SoundCloud. Length: Your finished work should be between one and three minutes long. Title/Tag: When adding your track to the Disquiet Junto group on Soundcloud.com, please include the term “disquiet0146-swypingsilence” in the title of your track, and as a tag for your track.